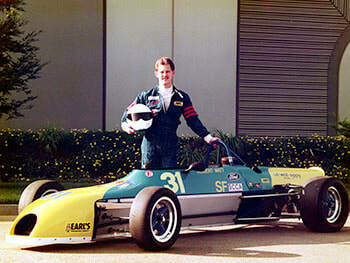 In the Winter of 1976, Dan Gurney called up Formula Ford ace David Loring and offered him a job making FF Eagles for Gurney’s AAR outfit in Santa Ana, California. Loring thought it was one of his friends playing a prank on him and promptly hung up. Gurney phoned back and again offered Loring the position of driver, engineer and builder of the Eagle DGF (Dan Gurney Ford) cars. AAR junior designer John Ward designed the DGF, his first race car design. Loring would go on to build 13 DGFs with the help of Phil Remington. 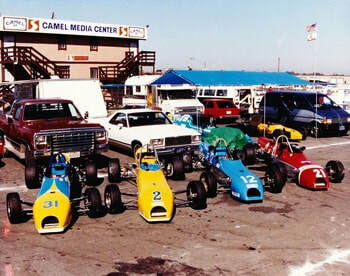 In ‘78, the DGF program was cancelled late in the year, as AAR was not taking in the orders needed to make the Formula Ford design a profitable entity. Despite the cancellation of the project, Loring still brought his team car (the rumor is he actually stole it) to the Runoffs and justified its potential, capturing the SCCA National Championship in dominating fashion, despite the jet-black car trailing smoke from the first lap on. Fast-forward to 2009. 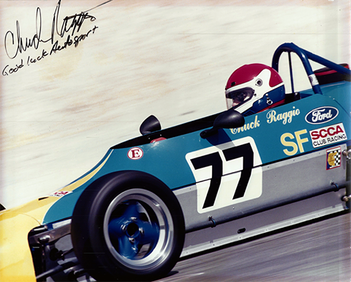 The KMPR crew was just regrouping from their run in the SCCA MX-5 Cup Pro Series, when driver Jacques Dresang saw an advertisement in Vintage Racecar magazine showing a ‘77 Eagle DGF for sale in southern California. After 5,000 miles traveled and a few hours of sleep, the team had the car back at their Milwaukee-based shop for restoration. In the process of purchasing the car, a landslide occurred in California and to-date, the car has does not have its logbooks. It has been confirmed by its previous owners that DGF #005 was originally run in the Denver Region of the SCCA. The car was purchased new by WWII veteran Bob Tankersley, who campaigned the car for a number of years. Later Dirk Piz, Robert Watt, Chuck Raggio, Bill Kincaid and James Hakewill all drove the machine, with some success in the Club Ford and Spec Ford ranks in California. KMPR had their hands full in the restoration process. Upon delivery, they found that the rear of the car from the roll hoop back had been twisted after what was believed to be a shunt at Laguna Seca. KMPR chief tuner Paul Jay constructed a new rear bulkhead assembly based off of the original AAR prints. Parts were machined and developed to maintain the look and integrity of the original design, but improved to stay current with SCCA guidelines and safety improvements. In the car's first four events with KMPR, it managed two victories, a second, and a sixth. 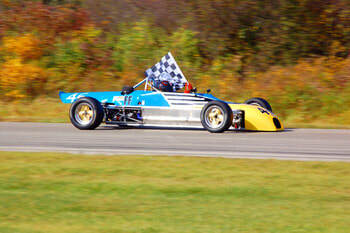 One of its two victories came at the SCCA Chicago Region Fall Sprints, where it competed against and beat FF's 30 years newer than it, proving that the old bird still had potential. At the 2011 SCCA June Sprints at Road America, the KMPR team suffered the first incident with the DGF, when the RF upright failed under load heading into the T5 braking zone. The car pitched head-on into the outside wall, damaging the Eagle and driver Jacques Dresang's foot. Dresang was in a cast for three months and the Eagle is still nursing its way back to health. When the accident at Road America happened, the team had just got done installing fresh bodywork with a AAR tribute livery, taking out the yellow. With the recent finding of Tankersley's ride being fully-yellow, KMPR decided that it would only be correct to revert the car to have a hint of its racing past on-board. Since then, the car managed a win at the 2016 Weathertech International Challenge in Club Ford, the 2017 SVRA Spring Festival and also finished second at the 2017 edition of the WIC, third overall among 23 Formula Fords. The 2017 season ended with the #46 car atop of the Monoposto Club Ford point standings, capturing the Monoposto title.